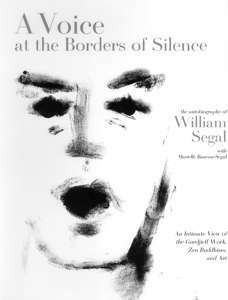 The following excerpts are taken from A Voice at the Borders of Silence: The Autobiography of William Segal, An Intimate View of the Gurdieff Work, Zen Buddhism and Art. Foreword by Robert Thurman, preface by Peter Brook. Copyright © 2003 Marielle Bancou-Segal. Published posthumously and edited by Mark Magill, the book features over 275 photos and illustrations. William Segal’s life is explored through his own writings and artwork, and through interviews with D. T. Suzuki, Ken Burns, Michel de Salzmann, Paul Reynard, James George, and many others. Reprinted by arrangement with The Overlook Press. William Segal: It’s interesting to go back to one’s first recollections of a meeting with a man of the stature of Mr. Gurdjieff. I recall his entry into the P. D. Ouspensky estate in Franklin Farms. There were a number of people waiting for him. One felt the movement of the atmosphere around him as he entered the magnificent hall. What struck me immediately was the presence. Then he did something that was very revealing to me. He looked around the table and he saw the lords and the ladies, the people who were preeminent in Ouspensky’s work at that time. And he said, “Who is in the kitchen? Bring out the people who are in the kitchen doing the work.” It struck me immediately as a demonstration of the democratic attitude of this really unusual character. He could size up people, a situation, the truth of the moment. One had to respect that. I was trained as a journalist, and I had the experience of meeting a number of spiritual characters around the world. But there was something very different about Mr. Gurdjieff. Absolutely no pretense. He was an authentic spiritual master. This was the feeling that I received on first contact. . . .
Michel de Salzmann: You, yourself, have been involved in this work for half a century. De Salzmann: You’ve also helped hundreds of people to find their way in their search within themselves and also into a “real world,” as it is said. And in your heart, what would you say is there? In other words, what is the specificity of the teaching for you? In recent years, there has been a stream of books that use a blend of ancient Buddhist truths and common sense to show busy Americans how they can open an "inner door," as the Dalai Lama expresses it. How intrigued the Dalai Lama would be to read this posthumous autobiography of William Segal. Surpassing any effort at practical or everyday spirituality in recent memory, this beautiful work shows what it means to live, as Segal called, a "double life." Segal was, judging by this record, a gifted athlete, a tough and independent businessman, an acomplished artista true rugged individualist. Yet his whole, rich, varied career reportedly was suffused with an inner stillness, an openness and meaning, that came from a deep, lifelong spiritual practice. Pulled together by Segal's wife, Bancou-Segal, with the help of editor Magill, this memoir is a kind of gorgeous scrapbook that includes paintings, photographs, articles, diary entries and correspondence with artists, thinkers, businessmen and great spiritual teachers. "Bill was a man of many layers and if the outer layer was the man of today, the innnermost core was an opening to eternity," wirtes one good friend, theater director Peter Boook, in a preface. Born in Macon, GA, in 1904 to poor Romanian Jewish immigrant parents, Segal was an archetypal American success story. A football hero at New York University, he became the innovative publisher of 11 magazines, including the ground-breaking Gentry. He was also, among other things, a painter, writer and editor, and important promoter of trade with Japan and a connoisseur of art, wine, fashion and life. Above all, however, Segal was a seeker of truthfirst as a sturdent of P.D. Ouspensky and G.I. Gurdjieff and, later D.T. Suzuki. Buy the end of this life at 96, he appears to have become a living embodiment of the Zen image of "the old man in the marketplace," conveying by his presence alone a sense of the wonder hidden within ordingary things. By all accounts soft-spoken and gracefully deliberate, Segal was, as the Buddhist scholar Robert Thurman writes in his foreword, a "quiet harbinger of enlightenment in the West." Bancou-Segal describes "Segal as an "avant-garde American of the Twentieth Century," and this book does seem especially timely and important now. It reveals what we can really make of our lives in a society the cherishes the individual. Segal offers brilliant proof that our proverbial drive and ingenuity can be used for something other than material gain, that our freedom can take us all the way to liberation.